This time every year the Cute Gardener and I struggle to use the last few butternut squashes that remain from the bountiful Fall harvest. By now we’ve exhausted our mental inventories of dishes like roasted butternut, butternut gratin, butternut pasta, mashed butternut instead of potatoes, butternut cream soups and smooth butternut purees, and diced butternut chunks in everything from pilafs to lentils. We have also used the best of the bunch and are left with the tiny runts, the scrawny, skinny long ones and the discolored strays that are more diluted in flavor than is normal. It is only natural that we would resort to the oldest trick in the book that makes any food taste good. The CG breaks out a huge pot and his oil and deep-fries a batch up for us. 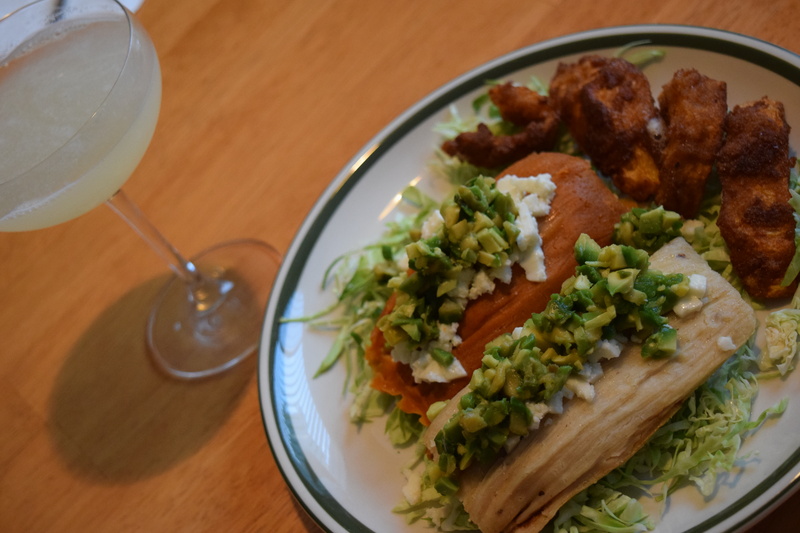 Paired with some local tamales from the Latino masa maker in our neighborhood, fresh cabbage from the garden and diced avocados from the backyard tree, the fried butternut is a sweet and crunchy natural adornment that combines sweet with savory. Even for a girl like me, who mostly eschews fried food in lieu of healthier options, it is hard to resist the combination of sweet squashes and an expertly blended fry coating that is mixed with care and creativity. Which brings me to mention another specialty recently discovered this month suddenly awash with fried squash. Every time the CG and I travel to the desert to see my family, we take the opportunity to eat dim sum in Monterey Park. This past weekend while habitually betting on a new place Mama Lu’s, we stumbled upon a dish called Fried Seaweed Pumpkin. With memories of fried butternut fresh in mind, I ordered the dish. At first I was certain the pumpkin would be wrapped in seaweed as a salty coating and then fried. What we received instead was a plate towering with plump pieces of rich, dense fried kabocha squash—the Asian gourd that is like a cross between pumpkin and butternut. It also has a rind that looks very much like seaweed so it’s no surprise those creative Chinese would imaginatively instead of literally name this dish. I loved it, although it was so filling that I could only down three pieces with the rest of the already plentiful dim sum items we had ordered. I took the rest home with me and although the fry coating had wilted in the fridge overnight, it crisped immediately back up after spending five minutes in a 360-degree toaster oven. 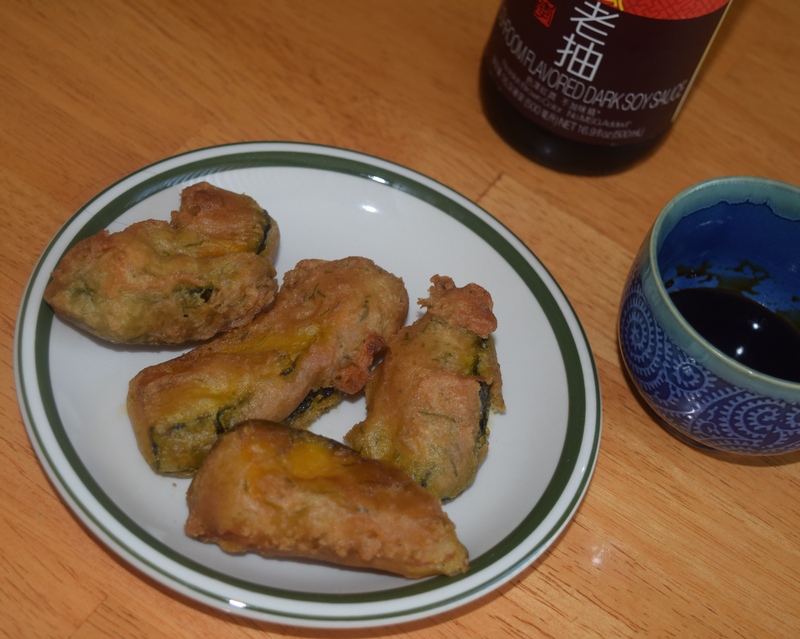 The kabocha was even better the next day dipped sparingly into dark mushroom soy sauce.